Whether your goal is to surprise your guests or advertise your entertainment to build anticipation, booking big name acts for your Houston area event, whether at the House of Blues or the Hyatt Market Street, is crucial to its success and far easier to arrange that you'd anticipated. 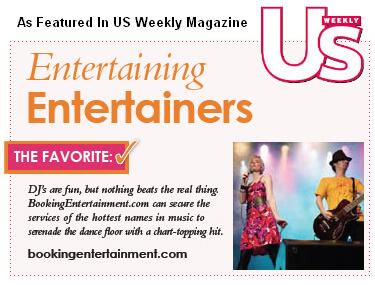 Booking Entertainment has been providing full service, turnkey events for clients seeking to reserve headline entertainment for their Houston area events, providing all in one, no surprise price, for over almost 20 years. To help make your Houston area event exciting and rewarding, almost any act is available. The Entertainment Request Form available here is the best place to start. By filling out some details, we can get a better idea of your needs for your upcoming Houston area event. Clients can confirm at this point whether or not they wish to move forward, and have the agent submit the formal offer to the entertainment chosen. Once the act accepts the offer, BookingEntertainment issues contracts and handles everything else. Booking Entertainment would love the opportunity to take its sixteen years in the business and use it to make your Houston area event an unforgettable experience.